Figure 1. 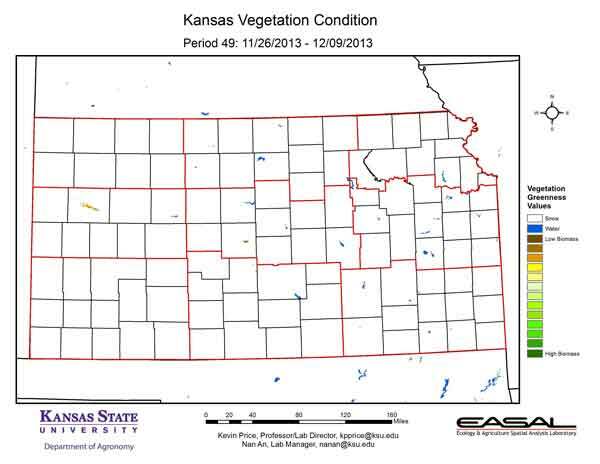 The Vegetation Condition Report for Kansas for November 26 – December 9 from K-State’s Ecology and Agriculture Spatial Analysis Laboratory shows that the entire state had snow during the period. Amounts varied considerably, with the highest amounts in the North Central Division. Lebanon, in Smith County, reported 6.5 inches while the Garden City Experiment Station reported a trace. Figure 2. 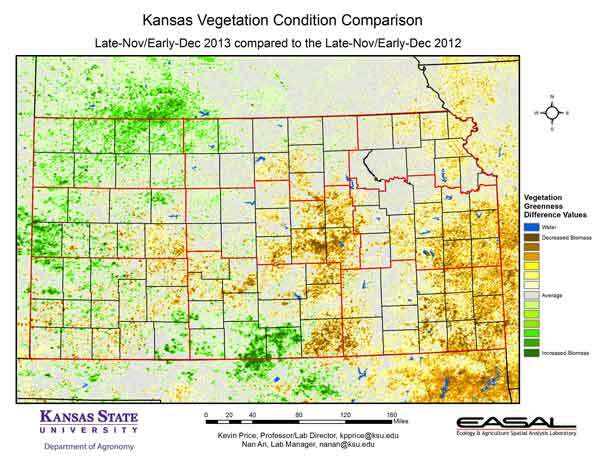 Compared to the previous year at this time for Kansas, the current Vegetation Condition Report for November 26 – December 9 from K-State’s Ecology and Agriculture Spatial Analysis Laboratory shows that the western areas of the state have the greatest increase in biomass production. Central and Eastern Divisions have the greatest decrease. More favorable growing conditions prevailed in western Kansas this year, while cooler temperatures have limited development in the east. Figure 3. 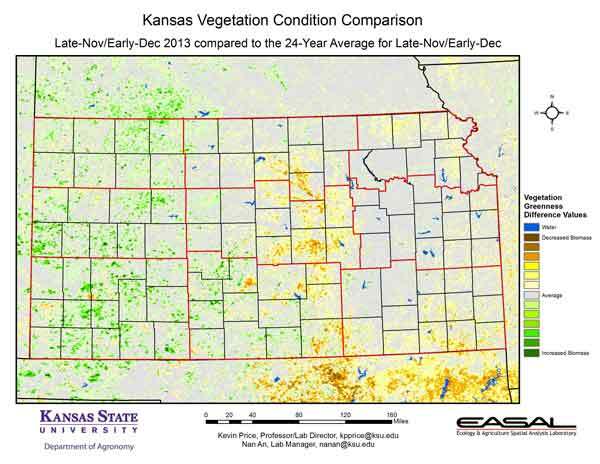 Compared to the 24-year average at this time for Kansas, this year’s Vegetation Condition Report for November 26 – December 9 from K-State’s Ecology and Agriculture Spatial Analysis Laboratory shows that conditions are very close to the long-term average. The western third is slightly better than average, with fall moisture continuing to be at or above normal. Temperatures made a relatively gradual transition from warm to cold, rather than an abrupt switch. Figure 4. 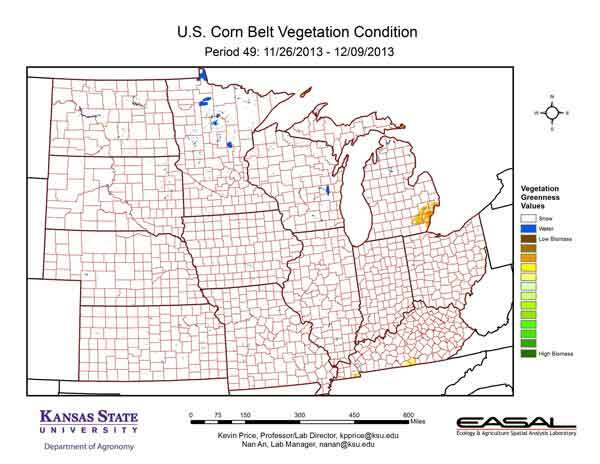 The Vegetation Condition Report for the Corn Belt for November 26 – December 9 from K-State’s Ecology and Agriculture Spatial Analysis Laboratory shows that most of the Corn Belt had snow during the period. On the 9th of December snow covered the entire region, with amount ranging from a trace in southwest Kansas to as much as 20 inches in Michigan. Figure 5. 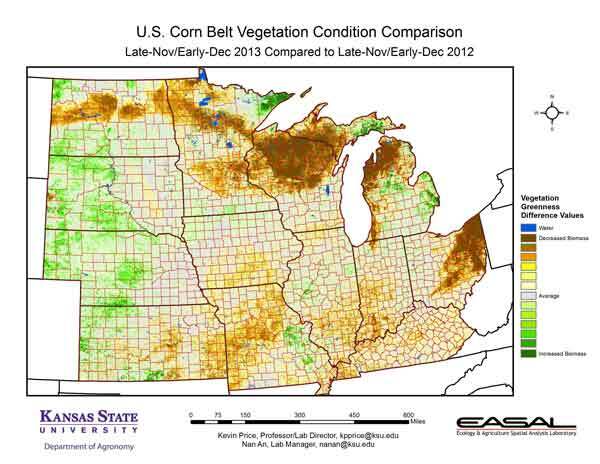 The comparison to last year in the Corn Belt for the period November 26 – December 9 from K-State’s Ecology and Agriculture Spatial Analysis Laboratory shows that lower biomass productivity is visible in the northern and eastern areas of the region. Much of this is due to persistent snow cover in these areas. Figure 6. 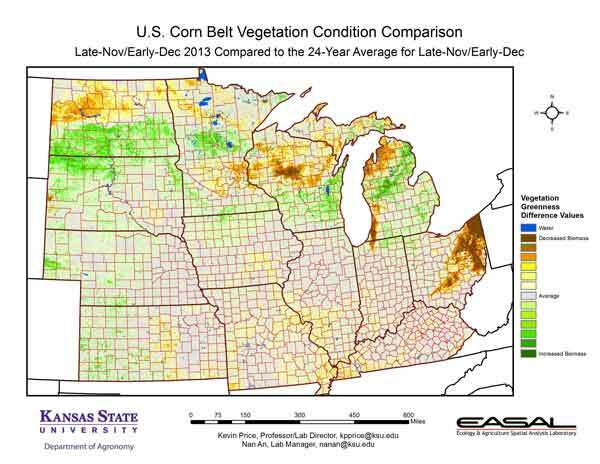 Compared to the 24-year average at this time for the Corn Belt, this year’s Vegetation Condition Report for November 26 – December 9 from K-State’s Ecology and Agriculture Spatial Analysis Laboratory shows that there is a sharp contrast along the northern areas of the region. Those sections with more persistent snow cover have slightly lower-than-average biomass production. Figure 7. 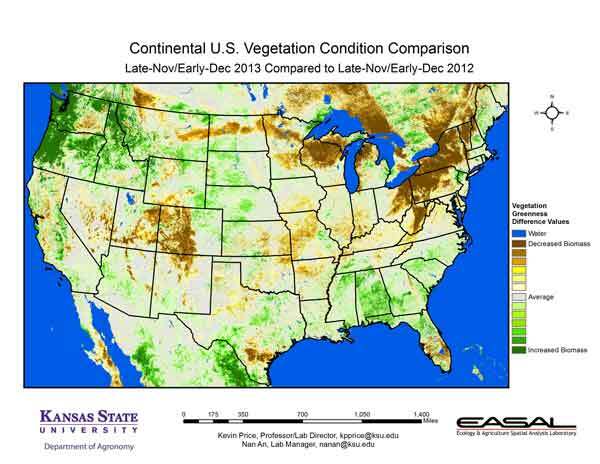 The Vegetation Condition Report for the U.S. for November 26 – December 9 from K-State’s Ecology and Agriculture Spatial Analysis Laboratory shows that snow cover was a factor as far south as central Texas. Vegetative activity continues to slow as cooler temperatures penetrate the South. Figure 8. The U.S. comparison to last year at this time for the period November 26 – December 9 from K-State’s Ecology and Agriculture Spatial Analysis Laboratory shows that the Northeast has the biggest decrease in biomass production. This year more than 70 percent of the area had snow cover on the 9th of December. Last year, that coverage was just 16 percent. The much-greater-than-average biomass production in the Pacific Northwest is also snow related. While snow coverage in this region is greater this year, the average depth is less. On December 9,, 2011 the average snow depth in the Pacific Northwest was 12 inches. This year the average is just 7 inches. Figure 9. 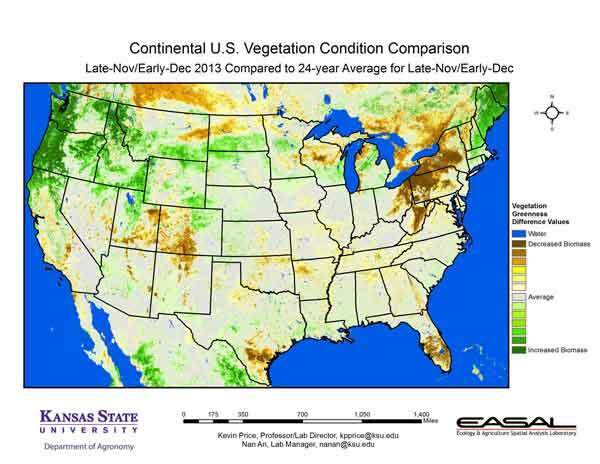 The U.S. comparison to the 24-year average for the period November 26 – December 9 from K-State’s Ecology and Agriculture Spatial Analysis Laboratory shows that the greatest contrasts are in the Northeast and the Northwest. 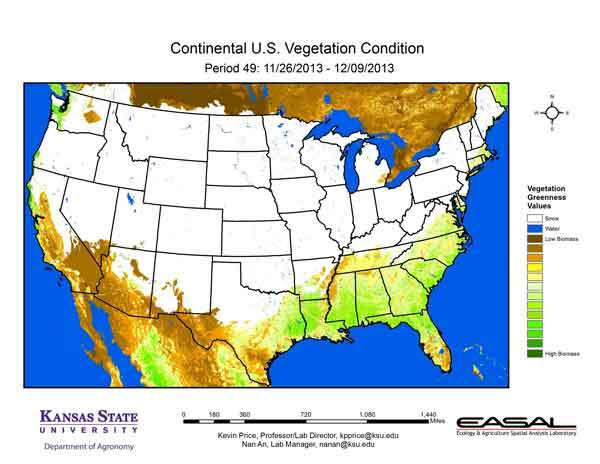 The Northeast has below-average vegetative activity. This is due to a combination of cooler temperatures and snow cover. In the Northwest, a smaller snowpack has allowed for above-average vegetative activity.